Volunteers play a vital role in the conservation and stewardship of Texas’ natural and cultural resources. By getting involved today, you can help keep Texas State Parks beautiful, accessible and fun for current and future generations. Opportunities are available in parks throughout the state for volunteers with varying skills and interests. We have short-term, long-term and one-time opportunities. For a list of opportunities and to apply, search current Texas State Parks volunteer opportunities or contact your park's volunteer coordinator to learn how you can use your skills and passion to give back to the land, resources, and park you love! Parks Hosts serve as representatives and stewards of Texas State Parks providing operational support to the park and information to the visiting public. Hosts assist with a variety of tasks, including fee collection, light maintenance, visitor education and campground upkeep. Host responsibilities will vary based on park needs. Live, learn, and serve in the park. To learn more about park hosting: Park Host Program. State Park Friends Groups are volunteer-led, membership-based nonprofit partners that support a park site through volunteerism, fundraising and public education. Friends Groups also serve as an important link to the local community. Check our list of current State Park Friends Groups and Support Organizations. If no group is listed for your favorite park, contact the park manager to see how you can help form a group. Outreach and Education Volunteers help inform and inspire park visitors and grow the next generation of park stewards through community outreach, education and outdoor programs. Interpretive services volunteers educate the visiting public about the cultural, natural and recreational resources of the park by providing tours, guided hikes, educational programming and more. Buffalo Soldiers bring history to life with stories, costumes and tools. State Park Ambassadors are young adults that use their interests, skills and creativity to draw new visitors to parks. The Texas Outdoor Family program helps introduce families to great camping experiences. Volunteers help in many capacities including assisting with nature hikes, kayaking, fishing, camping gear distribution, and safety management. Special Event Volunteers assist park staff with special events. Special events include clean-up projects, educational events, holiday activities and outdoor activities. Duties will vary depending on the event, but may include crowd control, set-up and clean-up, and overseeing activities. If you are interested in a one-time or short-term activity, look for these opportunities. If your troop, class, club, office or community group want to organize a volunteer event, contact your local park. Environmental Restoration and Maintenance Volunteers help preserve and protect the natural resources of Texas State Parks and create a welcoming and safe park for visitors. Environmental restoration volunteers help plant native species and remove exotic and invasive plants while learning the fundamentals of resource management. Maintenance volunteers work with park staff to maintain trails and park grounds by trimming brush, removing trash, mowing and assisting with minor construction projects. Office Administration Volunteers provide clerical support to park or headquarters staff. Volunteers assist with fee collection, greeting guests, data entry or filing. As a volunteer, you will be part of a passionate team working to manage and conserve Texas' natural and cultural resources. You will receive orientation and training and learn new skills! Volunteers under 16 must be accompanied by a guardian. Volunteers must meet the requirements of the opening to which they apply and must have skills and experiences that qualify them for the position. 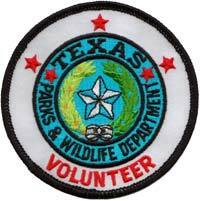 For opportunities and to apply, search the current Texas State Parks volunteer opportunities. If you need help navigating the page and applying, check out this How to Apply Online to Volunteer - Info Sheet. Thank you for caring about Texas’ wild things and wild places. They need you now more than ever!